Impress your guests with a multi-function favor that boasts elegance and style. 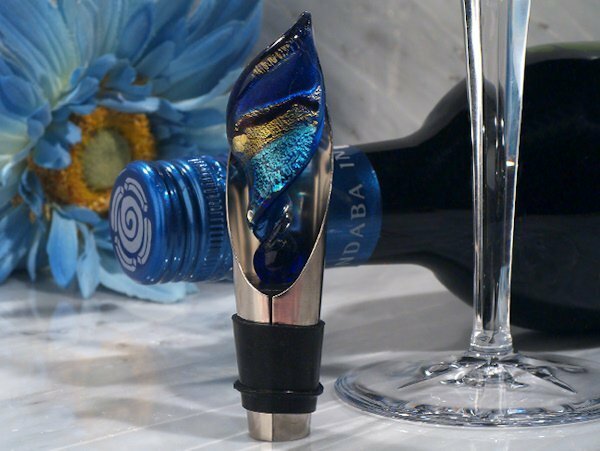 Our Swirl Design Art Deco Wine Pourer Favors include both a stopper and pourer. The handmade Venetian-like Blue and Gold twist design top is attached to a solid rubber stopper and sits in a chrome metal wine pourer. Each handmade favor is elegantly packaged in a satin-lined two piece white gift box. Measures 3.5" in length.